Principal of Aitchison College, Agha Ghazanfar, is has been removed from his post for not allowing nepotism under his watch and refusing to unfairly grant admission to the descendants of the rich and influential. Aitchison college holds admission tests for K2 class every year, this year, however, some interesting things have happened. The first thing that went wrong was that the admission test question paper was leaked a few days before the exam and hence the college administration had to create a new question paper just one day prior to the test. Second interesting thing was that the scions of some of the most influential families of the country were to appear in this test, namely, grandsons of Speaker of the National Assembly, Sardar Ayaz Sadiq, Banking tycoon, Mian Mansha, and ex Prime Minster, Yousaf Raza Gillani. However, they were subsequently not granted admission because they failed to get enough marks to make it to the merit list posted on the college’s website recently. According to sources, after the failure of the grandsons of the rich and famous to score the desired marks to gain admission, the principal, Agha Ghazanfar, was pressured by the above-mentioned individuals to grant their grandsons admissions, irrespective of their score in the admission test. Mr Ghazanfar refused to cave in to their pressures. Grandsons of Gillani, Sadiq and Mansha managed to score 40.22%, 18.78% and 19.44% respectively, much lower than the cutoff scores to gain admission. After repeatedly refusing to be dishonest, Mr Ghazanfar was told that he will lose his job if he does not grant admission to the grandsons of these influential personalities and was given one last warning, which he did not pay heed to. 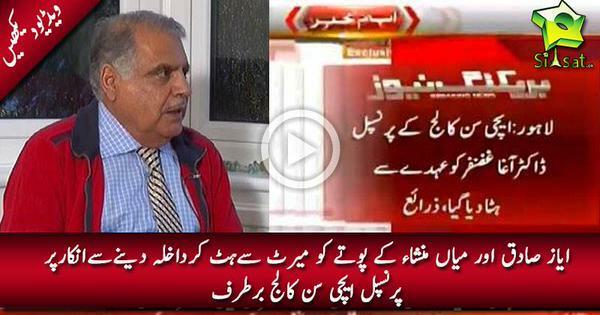 Mr Ghazanfar is due to be fired from his job tomorrow and all preparations to sack him have been completed. Talking to a private channel, Mr Ghazanfar verified the story and said that Aitchison is increasingly becoming a hotbed for corruption and the authorities do not care about merit anymore. Aitchison College, an old-boy school with illustrious alumni, used to be famous for adhering to principles and not giving admissions without merit. Mr Gazanfar, whose contract was for 5 years initially, is being removed after serving for only one year in reward for his honesty and dedication to the institute.